Around 15 kms from the state capital of Thiruvananthapuram is the one of the most famous beaches of India, for local as well as international tourists, the Kovalam Beach. The small village of Kovalam came into limelight due to its beautiful beaches; those were thronged by tourists from all over the world. The uniqueness of the beaches was what attracted the tourists to this tiny village. Kovalam in the local language means, place fringed with coconut palms, and indeed it is. 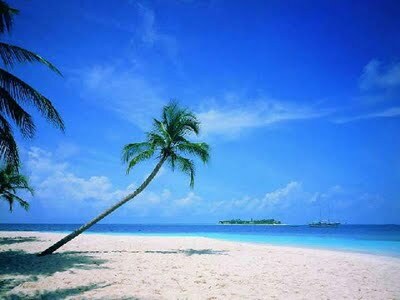 Kovalam is full of coconut trees and soothing seashore, one of the best in India for swimming and other water sports. 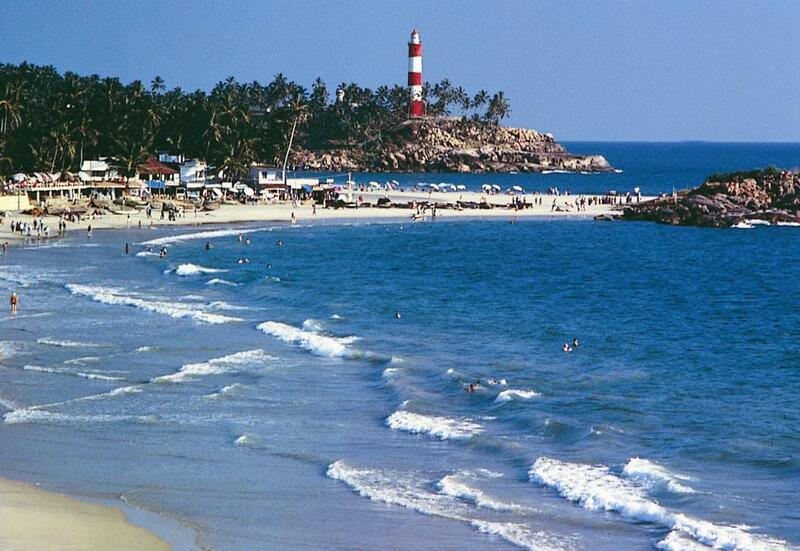 The beaches of Kovalam are in a crescent like shape and can be divided in three parts. To the south is the most popular beach known as the lighthouse beach. One can have a spectacular view of the Vizhinzam Mosque from here. The northern most beach is known as the Samudra Beach and in between lies the beach called Hawah. While the other two beaches are mostly used for fishing purposes, it is only the Lighthouse beach that is full of tourists day in and out. The soothing sand, the cool breeze and the beautiful sea, is the best place to relax. Kovalam beach offers many other options for relaxation such as the Ayurvedic massage parlours and Yoga classes. To top all the wonderful sea cuisine to cheer one's palate is always there. The nights on the beaches are enlivened with the traditional Kathakali dance performances and various other folk forms of art performed by the local artists. Location: It is located at a distance of around 15 kms from the capital of the state of Kerala, Thiruvananthapuram. This is another picturesque beach near Kovalam. The serene and calm atmosphere draws many people to this place every year. It is famous for the various beautiful sea birds that visit this place. Thus this beach in Pachalloor is also considered to be a birdwatchers' paradise. This magnificent old structure was the home to the late Maharaja Sree Chitra Thirunal Bala Rama Varma. This grand palace is admired mainly for its architectural splendor. In this place near Kovalam you can enjoy the Kerala backwaters. There are facilities for cruising in the water while you enjoy the surrounding greenery. The Parashuram temple in this region also attracts many pilgrims every year. Located on one of India's most popular beaches, Kovalam, the property is spread across 10 acres of land, offering a breathtaking view of the backwater, lush landscapes, coconut palms, and unspoiled beaches. With its exotic tropical beauty and relaxing hospitality, this getaway is the perfect place to enjoy relaxation and rejuvenation of the mind, body, and soul. 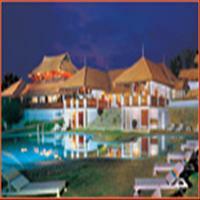 Sagara Beach Resort is a small friendly hotel in front of the light house beach of Kovalam. It has 42 air conditioned rooms, each with twin beds, en-suite toilet and shower, running hot and cold water etc. All the rooms have balcony with a view of the Arabian sea, which is a perfect venue for your early evening G & T. The hotel has an ayurvedic Centre, swimming pool and a restaurant on the roof. Samudra - the word means Ocean - is your perfect seaside getaway. The hotel lies sprawled languidly in la luxuriant landscaped garden that won acclaim as the best in the State at the annual International Flower Show held at Thiruvananthapuram.